I enjoy reading all of Steve D&apos;Antonio&apos;s great "gearhead" articles. Having just read his two-part series on LP gas systems (PMM Oct. and Nov./Dec. &apos;09), I have a question. I have two horizontal aluminum tanks under the brow of the flybridge on our 1993 38-foot boat; the tanks are farther than 20 inches from any opening to the boat&apos;s interior. Is this setup compliant with ABYC standards? There are openings at the sides of the brow where it meets the flybridge deck that would allow any errant gas to flow overboard, and there are sliding windows under these openings, but they are always closed. The regulator is located under the brow. Without seeing your installation, it&apos;s tough to determine whether it is fully compliant. If the tanks are in an enclosed or semi-enclosed area that may having openings into the cabin or hull structure, or if there are any potential ignition sources, such as switches or lights, then there could be some cause for concern. 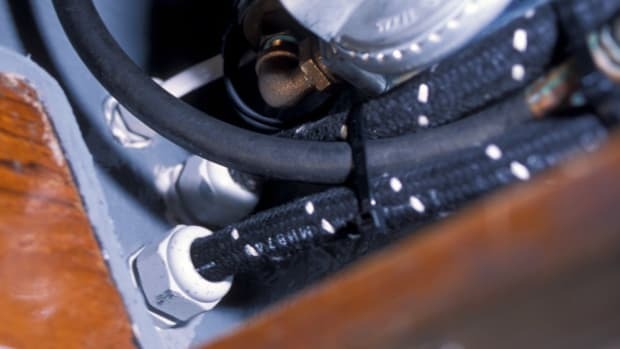 If by the "brow" you mean the area forward of the helm station, then the electrical equipment in this space is almost certainly not ignition protected, and it&apos;s likely that cables and hydraulic plumbing leading from the helm into the cabin below are not installed in a gastight manner. LP gas tanks should be stored in a dedicated locker that is vented directly overboard, or on deck, well away from all cabin openings. Additionally, from a letter-of-the-law point of view, I&apos;m afraid that relying on nearby windows or ports to be "always closed" voids the installation&apos;s compliance. My displacement boat, an Albin 27, is way overpowered, and I end up using the engine a lot at idling speed, or about 1000 rpm. My engine is a 155hp Isuzu 6BD1T. Do you know of any additives I can put in the diesel to help reduce or eliminate the resulting buildup? There&apos;s nothing better for preventing carbon, varnish, and sludge buildup in a diesel engine than regular use at cruising rpm, or about 80 percent power. Barring that, running the engine up to this power range for about 15 minutes out of every four hours of underway time, while not as good as running at 80 percent load 80 percent of the time, is desirable. There is no shortage of fuel additives on the market that claim to prevent all of the aforementioned buildup issues, as well as a host of other problems. However, these claims must be taken with the proverbial grain of salt: if it sounds too good to be true, it often is. When it comes to performance-based additives, I recommend and use Stanadyne Performance Formula. It&apos;s made by a manufacturer of fuel injection systems. These folks clearly understand what makes these systems work, and not work.